The third annual Avant Music Festival celebrates the 100th birthday of John Cage, the centennial of the premiere of Arnold Schoenberg’s Pierrot Lunaire, and contemporary experimental works by Randy Gibson, Eve Beglarian, and Jenny Olivia Johnson. Video by Oscar Henriquez. Commissioned and Performed by Ekmeles Vocal Ensemble - Mellissa Hughes, soprano; Mary Mackenzie, soprano; Eric S. Brenner, soprano/countertenor; Patrick Fennig, countertenor; Matthew Hensrud, tenor; Michael Weyandt, baritone; Jeffrey Gavett, baritone and director with sine wave drones. 4pm: John Cage’s Sonatas and Interludes performed by Vicky Chow, piano. Eve Beglarian, Randy Gibson, and Jenny Olivia Johnson discuss John Cage, Contemporary Music, and the working life of a Composer. Concert for Piano and Orchestra performed by Vicky Chow, piano - with: loadbang, Gelsey Bell, Drew Blumberg, Nicole Camacho, and Victor Lowrie, orchestra. Ryoanji performed by William Lang, trombone; Megan Schubert, voice; Randy Gibson, percussion. Nocturne performed Vicky Chow, piano; Drew Blumberg, violin. for rainsticks, piano, sine wave, silence - performed by Drew Blumberg, Vicky Chow, Randy Gibson, and William Lang. This evening's program, celebrating John Cage's 100th birthday, was co-curated with Festival composers: Living Room Music (Johnson), Ryoanji (Gibson), Nocturne (Beglarian). Includes the works: Cutter, Dollar Beers (Redondo Beach '96), After School Vespers (Solemn), Starling. The Pierrot Project (Megan Schubert, Sprechstimme; Nicole Camacho, flutes; Alejandro T. Acierto, clarinets; Josh Modney, violin and viola; Mariel Roberts, cello; Chris Goddard, piano.) with Megan Schubert and Lucy McVeigh, sopranos; Jude Traxler, percussion; Jeffrey Gavett, conductor; Jenny Olivia Johnson, electronics. After School Vespers (Solemn) was a World Premiere, and was written for the festival performance. 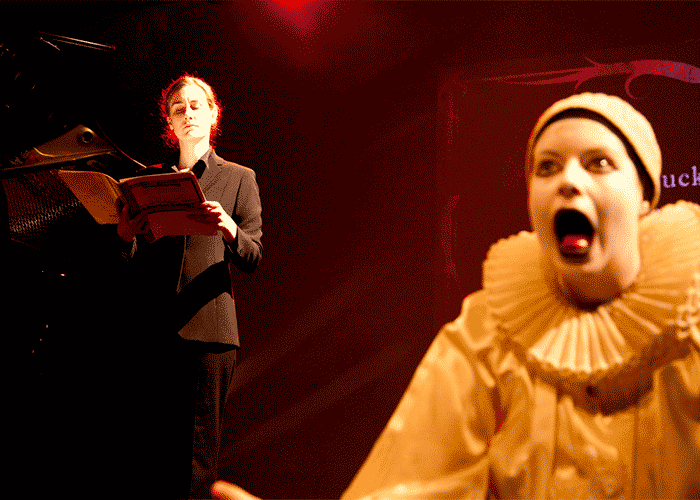 2012 was the 100th Anniversary of the World Premiere of Pierrot Lunaire. Eve Beglarian, voice; Ekmeles Vocal Ensemble - Megan Schubert, soprano; Rachel Calloway, mezzo soprano; Eric S. Brenner, soprano/countertenor; Jeffrey Gavett, baritone and director; Vicky Chow, piano; Ana Milosavljevic, violin. Video by Oscar Henriquez. William Lang, trombone with sine wave drones and digital delay.